This fabulous lunch at La Piola was a refreshing break from a full day of tastings. The Ceretto family operates two restaurants in Alba, both in essentially the same space. Located on the ground level of a historic building in the old city center, La Piola specializes in mostly traditional dishes served in an informal setting. Piazza Duomo occupies the upstairs level and is the showcase for Enrico Crippa’s innovative, award winning cuisine. 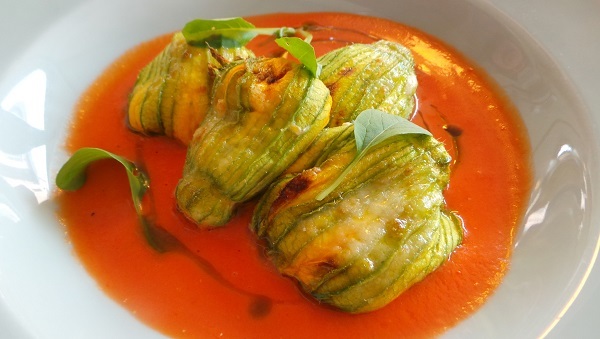 The fried zucchini flowers are fabulous and a perfect way to start this lunch. Alba boasts a fabulous vegetable market that is one of Italy’s best. When zucchini flowers are available, I never miss them. Red peppers stuffed with tuna and anchovies are a staple of the Piedmontese kitchen. At La Piola, the traditional agnolotti are the vehicle for expressing those super-classic flavors in a more modern, deconstructed style. 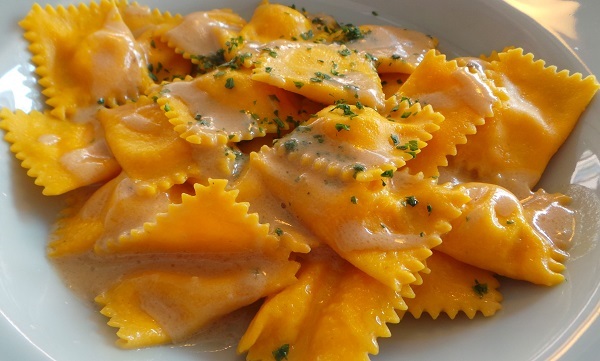 My agnolotti are perfectly cooked and bursting with flavor. In a word: superb. I have long been a fan of Bérèche. These gorgeous, artisan Champagnes are very hard to find in the US, so I rarely pass up a chance to drink them when I am in Europe. 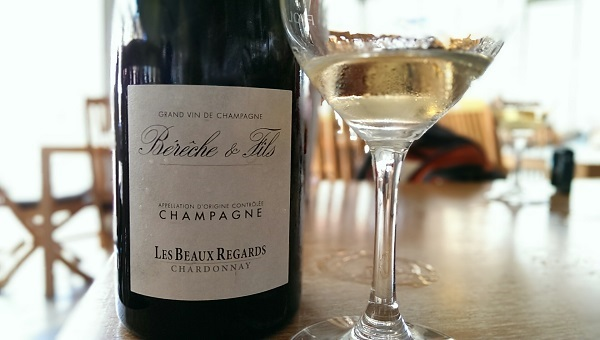 The NV (2010) Beaux Regards, 100% Chardonnay, bristles with energy, tension and varietal nuance. Gorgeous on its own, it is even better with our food, as the bright, chiseled acidity cuts through the richness of the flavors. Davide Rosso’s 2008 Barolo Cerretta comes across as wilted and lacking depth, both telltale signs of a wine that has not been stored properly at some point during its life. Readers spending time in Alba should give La Piola a try. While a bit more expensive than most restaurants in its category, La Piola is terrific and well worth a visit.